If you are like me then at one point in your career you may have thought that servo jerk limits or attributes have no effect on the way a servo works in an MAM or MAJ instruction but hat could be further from the truth. Just like other input features Rockwell’s servo instructions, the servo accel and decel jerk of the instruction is only enabled in the movement equation if the move instruction is set to be an S-curve and not a trapezoid. Having trouble understanding how servo accel and decel jerks work? A MAM (Motion Axis Move) instruction is best used for illustration. This is because it is possible to make the servo move by starting and stopping to show acceleration and deceleration respectively. The changes will, therefore, imply the movement from one set position to another position. 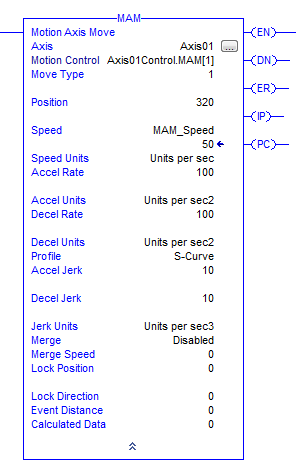 In this way, both the acceleration and deceleration jerks can be used to their full extent. This can be witnessed on the trends of the profile of the S-curve movement. This video demonstrates the differences between s-curves and trapezoids. It explores the effects that acceleration jerks actually have on the RSlogix 5000 servos by observing changing trends on the profiles of an s-curve and a trapezoid. Acceleration jerks have a great role to play in the speed of many servos and the RSlogix 5000 is no different. This can be proven by the experiments shown in a YouTube video that I put together for you. By setting the deceleration jerk to 25 and the acceleration jerk at 1000, and initiating ‘move’, a smooth s-curve can be achieved. The trends show gradual increase and decrease in the speed of the servo. Subsequently, changing the rates of the jerks to deceleration at 10 and acceleration at also 10 respectively, an s-curve with longer slopes is achieved. This implies that there were a longer deceleration and acceleration. The acceleration and deceleration rates are kept constant in order to fully observe the effects of the jerks. Another example is to change both the settings of the deceleration jerk and the acceleration jerk to 250 respectively for each – multiplying by 25. A more profound effect on the trend is expected in theory. A shorter acceleration and a shorter deceleration are hereby achieved as evidenced by a shorter s-curve. The shorter s-curve highlights the effects of the jerks. It is noteworthy that in all cases, the acceleration and deceleration rates were kept constant and only the jerks were altered. It is also worth noting that the acceleration and deceleration rates also have effects on s-curves although less than those of the jerk attributes. For example, setting both acceleration and deceleration jerks to 250 and using extremes on the acceleration and deceleration rates, the s-curve assumes a very sharp curve. However, this curve remains elongated. Generally, the closer one gets to 1000 in the setting of both the acceleration and deceleration jerks, the sharper the trend becomes as the profile begins to resemble a trapezoid. By subsequently setting to trapezoid – without any jerks – a similar profile is achieved on the s-curve. By setting both the acceleration rate and the deceleration rate to 100, a curve with sharper slopes is achieved. This is further evidence of the role which acceleration plays in the trapezoid as compared to the s-curve. The shape is similar to an s-curve however due to the obvious change in speed brought about by acceleration. Shown in the picture below is a trend of the same command but in a trapezoid profile. Setting the acceleration and deceleration jerks to 50, an effect is observed on the s-curve as it becomes more drawn out. This is evidence of the introduction of a new dynamic to the equation – the jerks. This is because the s-curve is able accommodate the effects of the jerks. Typically, lower values on both jerks mean more drawn out curves as it would take longer to accelerate and decelerate. A jog command can also be used for illustration. Since jogs are not start-stop commands, reducing speed suddenly causes the curves on the s-curve to become very sharp. This means there was no smooth transition. In this case, it is noteworthy that the jog command is only responsible for starting the servo while the stop command is issued on a separate instruction. The sharp trend illustrates the sudden transition in the absence of a stop command. So what is the best instruction use? This can be answered by looking at your application that is being programmed but also what instructions are needed for proper operation. An MAM can, however, serve as a start-stop command. By hitting target positions, the MAM can be used to both stop and start servos such as the RSlogix 5000. In the video, variable uses (adjustments) of the s-curve and the trapezoid while illustrating the foregoing inferences. This is in addition to highlighting the differences in trapezoids and s-curves and showing some of their components. Did you learn something from the video or the article? I would love to hear your feedback and am very interested in getting other viewpoints or topics that you would like to see. Please visit my Patreon site to provide me with feedback and be able to submit a special request for this you would like to see. Become a Member of this SPECIAL group today! Setting the acceleration and deceleration jerks to 50, an effect is observed on the s-curve as it becomes more drawn out. This is evidence of the introduction of a new dynamic to the equation – the jerks. This is because the s-curve is able to accommodate the effects of the jerks. Typically, lower values on both jerks mean more drawn out curves as it would take longer to accelerate and decelerate.